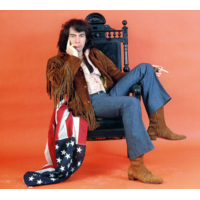 Neil Leslie Diamond (born January 24, 1941) is an American singer-songwriter. As a successful pop music performer, Diamond scored a number of hits worldwide in the 1960s, 1970s, and 1980s. According to David Wild, common themes in Diamond's songs are "a deep sense of isolation and an equal desire for connection. A yearning for home – and at the same time, the allure of greater freedom. The good, the bad and the ugly about a crazy little thing called love." As of 2001 Diamond has 115 million records sold worldwide, including 48 million records in the U.S. In terms of Billboard chart success, he is the third most successful Adult Contemporary artist ever, ranking behind only Barbra Streisand and Elton John. Though his record sales declined somewhat after the 1980s, Diamond continues to tour successfully, and maintains a very loyal following. Diamond's songs have been recorded by a vast array of performers from many different musical genres. Diamond was inducted into the Songwriters Hall of Fame in 1984, in 2000 received the Sammy Cahn Lifetime Achievement Award, and will be inducted into the Rock and Roll Hall of Fame in 2011.